Russian energy giant Gazprom and Japanese Mitsui & Co. Ltd. have signed a memorandum of understanding at the Eastern Economic Forum on the liquefied natural gas plant project Baltic LNG. The memorandum was signed after the meeting between Gazprom CEO Alexey Miller and Mitsui Chairman of the Board of Directors Masami Iijima. The parties discussed the ongoing cooperation on the Sakhalin II project and the prospects for collaboration between the companies. 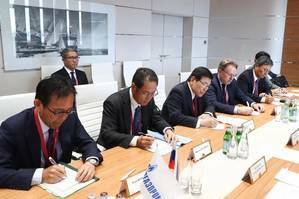 In particular, the meeting addressed the construction of the third train of the Sakhalin II LNG plant. Japan's Mitsui & Co., Ltd. (Mitsui) is focused on the development, purchase and sale, distribution and processing of all types of energy products in Japan and overseas, as well as on financial activities. Gazprom and Mitsui are partners in the Sakhalin II project, which includes Russia's first LNG plant. The Sakhalin II operator is Sakhalin Energy Investment Company Ltd. In September 2016, Gazprom and Mitsui signed the Memorandum of Understanding on LNG bunkering. In December 2016, Gazprom and Mitsui signed the Agreement of Strategic Cooperation. The document envisages collaboration in various areas, including Sakhalin II project expansion and LNG bunkering. In September 2017, Gazprom and Mitsui inked the Framework Agreement for cooperation on small- and mid-scale LNG.